All of the models we are discussing in these PSR Tutorial Lessons are known as "arranger" keyboards. The most distinguishing aspect of these keyboards is that they include internal "styles" that the performer uses when playing a song. These styles let you perform as a "one man band." You are playing your keyboard, but you also have an unseen drummer, a bass player, a guitarist, and even more members in your "band." Not only that, you have a wide variety of "bands" or even "orchestras" available to accompany you as you play. One song can feature a jazz combo, the next a polka band, then a latin group followed by a marching band and then a big swing band. All of this is accomplished by using the internal preset styles in your keyboard. In the next few lessons, we'll look at how you select styles, the component parts of a style, how you direct what the "band" plays, and, finally, what solo instruments you might use with your "band." You examined all the great solo instruments in the previous chapter. Now let's take a look at the rest of the band. Styles are grouped into eleven categories: Ballad, Ballroom, Country, Dance, Entertainer, Latin, Movie&Show, Pop&Rock, R&B, Swing&Jazz, and World. There is a separate style button, located on your keyboard to the left of the MAIN screen, for each of these categories. There is also a style button labeled "USER" or "USER/ACCESS" and that is where you can save your favorite styles. With each new arranger model, the total number of included "preset" styles increased. The Tyros included 300 styles. The Tyros2 added 100 more and the Tyros3 and Tyros4 models each added another 50. The current Tyros5 models hold 539 styles. The same is true of the mid-range models. The PSR-2000 included 181 styles, the PSR-3000 has 240 styles, and the S910 has 322 styles. The latest mid-range model, the PSR-S950 includes 350 Pro (prs), 32 Session (sst), 1 FreePlay, and 25 new "Audio" styles for a total of 408 styles. The more junior PSR-S750 has 295 Pro and 30 Session styles (and none of the new audio styles) for a total of 325 styles, 83 styles fewer than the S950. 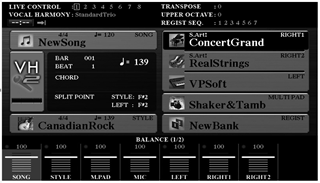 The Styles | Yamaha section of the PSR Tutorial shows you exactly what styles are included in each category for these keyboards. When you start up your keyboard on the Tyros3, the initial style loaded is EasyPop. This initial style depends on what keyboard you have. The Tyros4 defaults to StadiumRock and the Tyros5 starts out with the Cool8Beat style. The same is true on the mid-range models. The PSR-S970 starts with CanadianRock, PSR-S950 starts with Live8Beat and the S910 starts with Cool8Beat. The "STYLE" cell is on the MAIN screen right next to the [D] button on the Tyros models and the [E] button on the S910/S950 models. That cell tells you what style is currently loaded and ready to play. It also shows you the time signature and the default tempo for the currently loaded style. If you followed the VOICE lessons, you know how to select an alternative voice for the right or left hand. Selecting a different style is going to work the same way. If you press the button associated with the STYLE cell from the MAIN screen ([D] for the Tyros models and [E] for the S-9xx models), you will open up the STYLE display screen, which will show you the folder under the PRESET tab with the currently selected style. In the illustration shown here, the EasyPop style is highlighted and it is found in the Pop&Rock category of styles. If you want a different Pop&Rock style, just press the corresponding button ( [A]-[J] ). There are more available Pop&Rock styles as you can see from the pages at the bottom of the screen ([P1], [P2], [P3], [Next]. To see the next 10 available styles, press the upper [#2] button to go to [P2]. Styles 21 to 30 would be accessed by pressing the upper [#3] button. If you press the [#4] button for [Next], you'll see that there are three more pages of Pop&Rock styles available [P4]. [P5], and [P6]. Of course, if your keyboard is not the Tyros3 illustrated here, the number of Pop&Rock styles will vary. Like the VOICE display screens, notice that there is an [UP] button at the far right side of those page buttons. Pressing the upper [#8] button moves the display "up" to the parent folder. In this case, you would be going up one level to see all the available style folders. Pop&Rock is the first folder listed. There are 11 category folders in the Tyros3 and this first page shows 10 of them. If you went to P2, you would see the 11th category (World). All of the internal styles are found under the PRESET tab. But you could also have styles available in the USER area. You would use the [NEXT] Tab key to move to the USER area. In time, you will see that you can also have styles stored on the hard drive or your flash drive. You would use the Tab [NEXT] and [PREV] buttons to move back and forth among the four style tabs (PRESET, USER, HD1, USB1). If you have a PSR-3000, the tab choices would be PRESET, USER, CARD, USB. If you have a PSR-2000, the tab choices would be PRESET, USER, FLOPPY. Tab back to the PRESET styles. 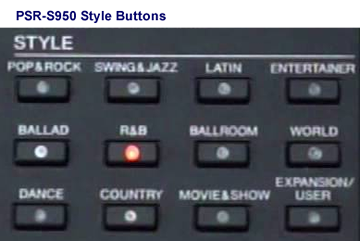 If you want to examine the available styles in the Swing&Jazz category, you would press the "D" button next to Swing&Jazz to select that category. As expected, you see the first 10 Swing&Jazz styles. In the screen shot here, the ClassicBigBand style has been selected for use. From the MAIN screen you could have jumped immediately to the Swing&Jazz Style screen by pressing the Swing&Jazz style category button. To look at available styles in another category, for example Country styles, just press the COUNTRY style category button. Try it now. You see how you can quickly look at any of the 11 categories. You still need to press the number buttons below the display screen to look at all the different pages within any given style category. Now that you know how to select and load a style, in the next lesson we'll take a look at the STYLE CONTROL section and the various parts of a style.